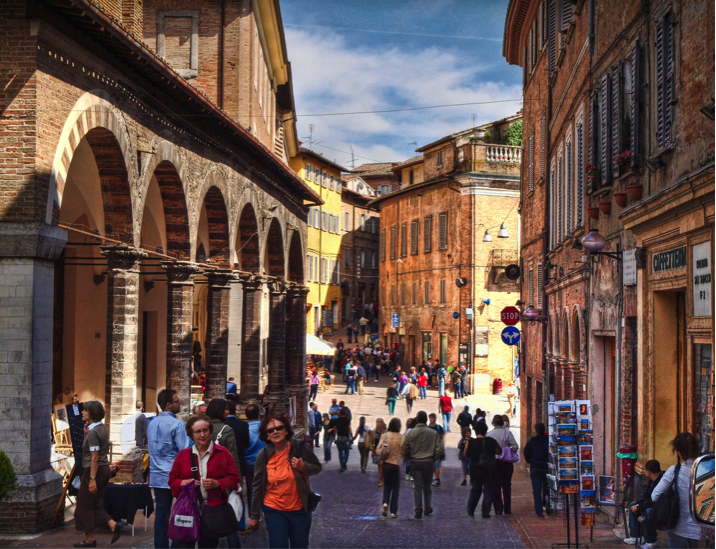 Explore one of Italy’s hidden gems, Le Marche region located in the central area of the country. This food and wine tour spans seven days and six nights, October 9-15, 2018. Discover wine, cheese and truffles as you embark on a journey that captures the beauty of the landscape and the region’s rich history. Learn more about this tour and all that it entails below. Don’t miss out on this opportunity to visit some of the most charming towns in the country. Questions? Contact us at 972-701-0070 or email us at events@theartofwinedallas.com. Arrive to Bologna (*Bologna, BLQ is the recommended airport). Take time to settle in and unpack before we all meet up. Ariane, and our host and native Marchigiano, Piero Pagliardini, will welcome you over drinks and give an overview of the week to come. Then pizza night! Enjoy the best pizza in town in an authentic Italian pizzeria. A stroll, a nightcap, and a good night’s sleep. Breakfast provided at the hotel of cappuccino and fresh pastries. Then time to wander the main squares and winding medieval pathways as you’re immersed in local color, texture, and flavors. Free afternoon to enjoy the city (we recommend a visit to the Palazzo Ducale or Raphael’s childhood home). Happy hour in the town square, followed by an authentic Marchigiano dinner and gelato at one of our favorite restaurants. Outing to neighboring village of Urbania where you can stroll through the traveling open-air market. Shop, socialize and taste everything in sight! For lunch we will drive through the Le Marche countryside for a trip to Cartoceto, a village famous for the best and only DOP olive oil imported from Le Marche. We’ll visit the inimitable Vittorio Beltrami, “The Einstein of Cheese,” says Lydia Bastianich, and not just because he looks like Albert Einstein but because he is a genius cheese maker. His pecorino di fossa – a sheep’s milk cheese wrapped in grape leaves, and buried under stone for 90 days is indescribably intense, earthy and like nothing you have ever tasted. From the cheese cellar, we’ll walk over to his shop where the family Beltrami will prepare us an in-depth sampling of the Beltrami cheeses, cured meats, and breads, with wine pairings along with house made sweets. Breakfast at the hotel. Load up for a visit to Sant’Angelo in Vado, Piero’s home town. Get ready for our morning TRUFFLE HUNT with professional local guide. Our seasoned truffle hunter, along with his dog, will lead us on an autumn walk through the forest in search of truffles. Mud boots provided! If hiking isn’t your thing, spend the afternoon shopping, relaxing in a café and exploring local treasures in the village. Break for lunch at the local Osteria. Back to the hotel to wash up and relax. Day trip to Sant’Angelo in Vado for the OPENING of the National White Truffle Festival! Once a year the town airs out its old wine cellars and turns these secret rooms into repurposed wine bars. Float from one wine cellar, or cantina, to the next, enjoying the variety of local and national wines paired with savory truffle-based delicacies. Each cantina has its own theme – from traditional (eat and drink at long, wooden picnic tables), to indulgent (buy the cantina mug, and enjoy free refills the rest of the weekend), to extreme (these cantine have been known to pack in DJ’s, dance floors, and motorcycles into the limited 100 sq.ft. space). There is something for everyone at the National Festival of White Precious Truffle of Marche and a reason why it has put Sant’Angelo in Vado on the map! Free afternoon at the festival. We will provide you with an itinerary of shows, demos and activities. Meet back up to eat-like-a-local with a truffle dinner in the town square. Return to Sant’Angelo to for a morning at the White Truffle Festival. Revel in the town’s festivities which range from street artists, to market booths, to live music. Buy roasted chestnuts on the corner or crostini with liver pate and truffle shavings from the local butcher. Lunch on your own. Piero will be there to make recommendations. Return to the hotel to pack and change. Meet that evening for a farewell dinner where we will raise a glass (or two, or three!) to our week in Le Marche. Cin-cin! Cheers! And a warm salute until next year!